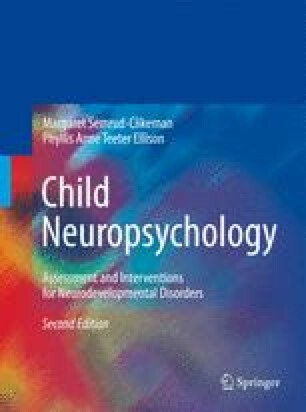 Neurodevelopmental disorders of childhood, including language-related and learning disabilities, constitute a large percentage of the childhood disorders seen by child clinical neuropsychologists. Language impairments and learning disabilities resulting from phonological core deficits are featured, as are mathematics difficulties resulting from nonverbal, reasoning, and perceptual deficits. Recently these disorders have often been combined with the new term, learning and language impaired. A large body of research has burgeoned over the past decade. There are some children who simply exhibit a language delay as well as a few children with a learning disability without a significant language delay. For that reason we will discuss language disability somewhat separate from learning disabilities although they are related and should be viewed as such.